For the first four decades of DC/National's existence, Superman was generally the preferred hero. Since the 1980s, (and also noting Batmania in the mid 1960s), it's been Batman. So which superhero do you truly prefer? While there's no set criteria for how you judge this, both characters have changed dramatically over time, and thus, won't hold up well to a single criteria. I would argue, for example, that if you base your decision on who is darker, Superman was a much darker character than Batman in the beginning. So place your votes and provide your reasoning below. Polls lock at 12am Wednesday, September 9th. Batman. In their heart of hearts, everybody secretly believes that we could have been Batman, if only we'd started training early enough. We never had a chance of being Superman. Plus Bats has the coolest rogues gallery. I love both characters, and it's hard to choose. But at the end of the day, I think I'd have to pick Superman. In my mind, I settle the debate like this: If such things were possible in real life, which sight would fill me with a greater sense of wonder -- a man in a bat suit pummeling a bunch of thugs, or a man soaring through the sky? To me, I'm torn apart by these two heroes that served DC Comics so magnificently for a very long time. Superman came out first and then a year later Batman arrived the scene and you've asked me which one do you prefer? Superman or Batman? That's is a very difficult question to answer and I have to choose one. One being the greatest Detective since Sherlock Holmes, a man with the greatest intellect, and designed a suit that strikes terror to the hearts of criminals of all likes! Or, one that defy gravity flying through air at supersonic later light speed, super-strength beyond our wildest dreams, and a collection of otherworldly powers that leaves others at his feet. I just can't imagine DC Comics existing without Batman and Superman. Without them DC Comics loses their core existence. Shaxper and other members of the Classic Comic Forum - I just can't cast my vote because I love them very much and I just can't imagine DC Comics without them. They are ICONS, POWERHOUSES OF DC COMICS, and 2/3 of DC TRINITY of Superman, Batman, and Wonder Woman. I'm appalled that you left out Wonder Woman - DC Comics premier Super-heroine? ... Without her, DC TRINITY can't be complete. A super-heroine with class, dignity, beauty, and a character that all girls that grace the comic book pages to be admired at. Sorry, no vote from me! Superman, and while I like Batman (and do think he has better villains) it isn't close. For all his power I think there is something strangely more relatable to Superman. As Clark Kent he is far more of an everyman than Bruce Wayne ever was and even in those periods like the Silver Age when his civilian life was not who he 'really' was there was always a certain level there that Clark Kent mattered: Lois, Perry, Jimmy, Lana... Clark Kent has friends and a life as Clark Kent. I think it's a coincidence that Superman's most iconic love interest is the civilian Lois Lane while Batman's is the villainess/anti-heroine Catwoman. I think Superman is overrated, he fights crime and only a few things can stop him. Batman, however, is a guy that fights crime and can be abused in many ways (physically, mentally). "Appalled" might be an overreaction, MG. As I tried to make clear in the OP, the question is being asked because, for the first forty years of DC's history, Superman was the all-around favorite, and for the second forty years, Batman was. This isn't about the DC trinity. It's about the fact that, if I ask any of my students today if Batman is cool, they will ALL say yes. And if I asked students 40 years ago if Superman was cool, they would have ALL said yes. Wonder Woman just doesn't have that kind of universal appeal with the general public, and she didn't even back in the Linda Carter days. This isn't about the inherent quality of Batman and Superman, nor an inherent perceived lack of quality in Wonder Woman. I have to go with Batman. I've warmed up to Superman quite a bit over the past few years, but I still think Batman is cooler. He's got the rogues, the psychological trauma of seeing his parents killed, the cool gadgets, the cool costume, plus, like foxley say, in their heart of hearts, everybody secretly believes that we could have been Batman, if only we'd started training early enough. plus, I just think that there have been more really good Batman stories than Superman stories, for whatever reason. I guess there are some newbies here who wouldn't already know my answer. I prefer Superman as an idea and a character, but there have been far more interesting Batman stories, particularly in the past thirty years. There's something about the Batman concept that rubs me the wrong way-- this is my take (although highly influenced by a post-Crisis viewpoint), but I find something troubling about a mentally ill man emotionally stunted by childhood trauma who can indulge his revenge fantasies due to a massive personal fortune and who consistantly endangers minors who have been beset by similiar tragedy celebrated as a hero. But that dynamic results in some fantastic stories. I understand your position and sorry that I use the word Appalled in a negative way but I love both Batman and Superman equally because I grew up watching Adam West's Batman and George Reeves Superman in reruns with my older brothers and we all loved the show with our hearts. Having said that ... I just can't not vote who is my favorite! Sorry Shaxper and the rest of the members of CCF. The edge would go to Batman. There are more eras of Batman stories I enjoy than Superman stories. I enjoy parts of both oeuvres, but more of the Batman body of work. Gotta go with Superman, just because I prefer the ideals he represents. I like my superheroes super and heroic. Superman, by a lot. His stories have always been about making adult decisions and doing the right thing. Batman (especially lately) is about holding onto your childhood tramau. Honestly, I see Batman's current greater-than-Superman popularity as a symptom of first world coddled baby "My Pain is SO IMPORTANT" syndrome. (And, conversely, since Superman acts like a grown-up they think that they can't possibly relate to him.) I've never seen Doctor Phil, but for some reason I blame Doctor Phil. Last Edit: Sept 2, 2015 15:40:16 GMT -5 by Reptisaurus! 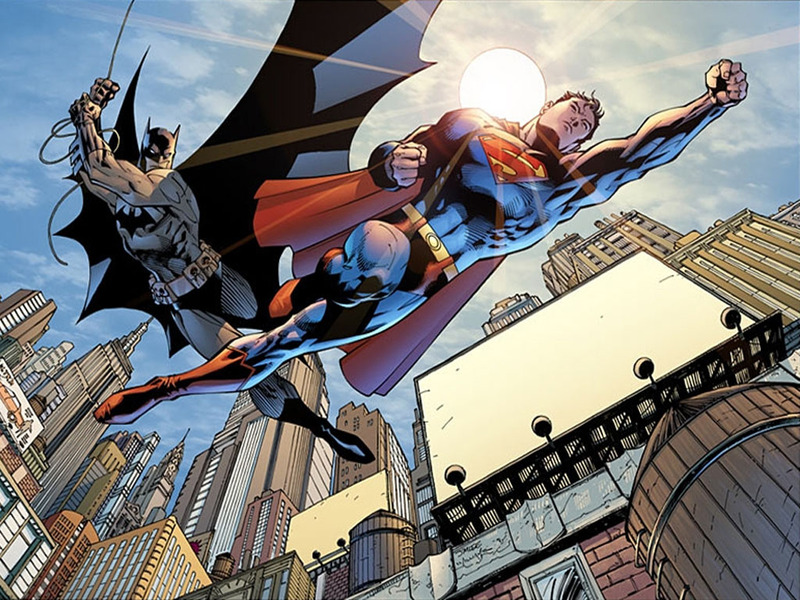 Since I first read a comic book it has been Superman #1 and Batman #2. What is odd to me is that the gap has widened as I've gotten older.